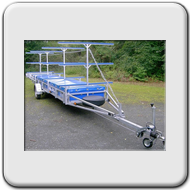 We offer a complete range of single axle and double axle rowing boat trailers from 750 to 2.500 kg gross weight. 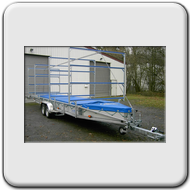 All trailers are designed to the customer´s needs. 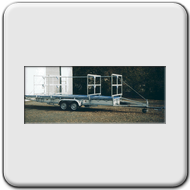 The trailers have a totally welded and hot dipped galvanized tubular frame, manufactured as solid double layer chassis. Trailers with more than 1.500 kg gross weight are equipped in addition with a V-supporting-undercarriage to reduce sagging to a minimum. This avoids stress damage to boats during the transport. All trailers have one or two rubber shock axle(s) with individual wheel suspension and an overrun brake with ball coupling. Generally a trailer can carry the double quantity of competition boats in relation to touring boats. Each trailer could be equipped with 2-4 build-on-frameworks. They are adjustable to basic supports at the tubular frame to accommodate the most suitable load. 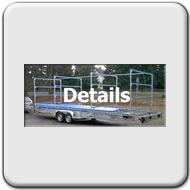 Concerning the size and capacity of the trailer as well as the quantity and types of boats to be transported the build-on-frameworks are available with one to five racks in height. On demand the top rack is adjustable. The build-on-frameworks exist in a closed version (mostly required for the transport of touring boats) as well as in an outside open version with one or two middle bars. The racks themselves are covered with a thick layer of rubber padding to further protect the boats from damage.